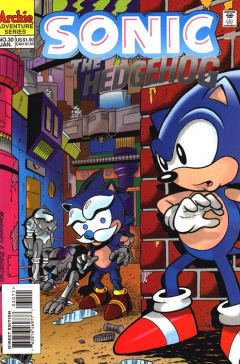 Sonic the Hedgehog 30 is the thirtieth issue of the Sonic the Hedgehog comic. This comic features only two stories: The Return of Uncle Chuck and Who Keeps Stealing My Chaos Emeralds? This issue also features a sneak peak at the Knuckles' Chaotix special. 2 Who Keeps Stealing My Chaos Emeralds? Sonic dreams of being with his Uncle Chuck, un-roboticized, and making him his favorite food: chili dogs. He wheels them to Sonic by the wheelbarrow-full, while Sonic keeps chomping down on them. Sonic is actually sitting outside on a tree, and is woken up by Sally, as she catches him eating one of his sneakers in his sleep. He quickly puts his sneaker back on, telling Sally that he was dreaming about Uncle Chuck again, missing the time he spent with him. Uncle Chuck had a chili dog stand that attracted much attention, and was especially loved by Sonic. Robotnik's tyranny, however, put an end to that, leading to Uncle Chuck's roboticization. Sonic, having swore to get Uncle Chuck back, feels down for not doing so already, but Sally tries to convince him that they'll get him back eventually. Sonic sits down, missing Uncle Chuck's chili dogs, and can only think of what Robotnik has Uncle Chuck doing at that time. Unknown to Sonic, Robotnik does, indeed, have plans for Uncle Chuck. Robotnik has finished the repairs to the transdimensional transporter and intends on testing it with Uncle Chuck, despite Snively's protests as it is their most efficient bot. Robotnik doesn't care, as if the transporter works, Uncle Chuck will return. If it fails, he'll roboticize Snively to replace him instead. A nervous Snively, talking behind Robotnik's back, puts on a pair of headphones and prepares to run a test on the power lines to the transporter. Robotnik pushes Snively aside, demanding that there's no need for a test of a test, and decides to activate the transporter himself. He presses a button against Snively's suggestions, engulfing him and Uncle Chuck in electricity. He disappears into the transporter, leaving Snively alone. Snively looks up at the transporter screen, revealing Robotnik's head. He's been trapped in the Void, so he orders Snively to return him back. Realizing that Robotnik can't control him from the Void, Snively takes the opportunity to take command. Having watched Robotnik fail so often, he feels he can do better. He walks away to take care of the Freedom Fighters himself, leaving Robotnik in the Void. While walking out, Snively doesn't realize that the transporter had another side effect: the returning of Uncle Chuck's self-consciousness. Later on in Knothole Village, Sonic has brought Uncle Chuck back to the group, so they celebrate by having a barbeque. Uncle Chuck cooks his famous chili dogs while he tells the others his news. He tells them about Robotnik being trapped in the Void and Snively taking over command. Sonic, however, thinks that Snively is barely a threat, though Uncle Chuck reminds him that Snively will happily use the transdimensional transporter for his own needs. Sally decides to get a second opinion, taking out NICOLE and asking it the likely result of the day's events. Analyzing the situation, NICOLE determines that Snively could destroy the entire planet. While Antoine tries to chicken out, Uncle Chuck has a plan of his own to stop Snively. As he is unaware of Uncle Chuck's true nature, he could use it as an advantage to be a spy for the Freedom Fighters. Back in Robotnik's lab, Snively returns to confront Robotnik, now wearing a version of Robotnik's costume. Snively decides to show Robotnik his plans to defeat the Freedom Fighters once and for all: the attach a miniature transdimensional transporter to a bot plane and swallow up sections of Mobius. Robotnik yells at Snively, telling him that the device is too powerful to use on the planet and that it will destroy everything. Snively shrugs it off, thinking he's chicken, and intends to continue on with his plan, just as Uncle Chuck arrives. He orders Uncle Chuck to take his plans and order the troops to build the plane according to his specifications. With the plans in hand, Uncle Chuck prepares to notify Sonic of Snively's idea. Outside the plane factory, Uncle Chuck meets up with Sonic and notifies him of Snively's plan to build a transporter plane. He has to attend to another matter, so he has Sonic go on in and destroy the plane himself. Sonic quickly infiltrates the factory, but has trouble finding the plane, especially since he has no idea what it looks like. Suddenly, he comes upon something surprising: Snively in the already-built plane. He fires at Sonic and successfully traps him in the Void. He gloats at his victory, something Robotnik couldn't do over the past number of years. He activates a display in the cockpit, allowing him to talk to Sonic in the Void, continuing to gloat. Sonic, however, is not amused, sending Snively into a further fury of madness. He aims the plane at the ground and fires the transdimensional device, wiping out a great amount of terrain. Sonic warns him that his madness could throw the planet into destruction, but Snively thinks the Freedom Fighters will surrender before that happens. While in the middle of laughing, a blast shakes the plane. Snively looks back to see a SWATbot plane pursuing and firing at him. The plane is being piloted by Uncle Chuck, under command of an unknown being. He continues to fire, but Snively believes he is the better pilot. He also believes that the plane is being piloted by the Freedom Fighters, so he decides to fire the transporter device on them. Being in the Void, Sonic realizes his speed will not be able to help him in this situation. He then comes up with an idea to distract Snively to allow the plane to hit them. He grabs two chili dogs from his backpack and takes a huge loud bite, quickly distracting Snively due to the noise. The distraction is enough to slow Snively down, giving Uncle Chuck the opportunity to fire. He does so, successfully hitting Snively's plane. The blast has knocked out Snively's thrusters. Without the thrusters, all his plane can do is hover, ruining his plan. Sonic tries to convince him to surrender, but he comes up with another idea. He intends to self-destruct the plane, causing a blast that will send everything within a 100-mile radius into the Void. Despite being on the plane, Snively has a belt buckle device that will allow him to return to Mobius. He starts to laugh, but notices a large shadow looming over him. He looks up, just as Robotnik, back from the Void, crashes through the plane's roof and onto Snively. He looks on in shock as his master has returned, having been brought out from the Void by the now sentient Uncle Chuck, believing Robotnik would be the only person able to stop Snively. He had been in Uncle Chuck's plane the whole time, which is now floating above Snively's plane. However, to gain freedom, he promised not to harm the Freedom Fighters and Snively. Therefore, he intends to use the many years he has making Snively's life miserable. He then yells at Snively to take off his duplicate uniform, but he has an issue taking off the boots. An angry Robotnik starts chasing him around the plane while Sonic watches, laughing. Some days later, Sonic has been retrieved from the Void and Uncle Chuck is back with the Freedom Fighters. Sonic promises to change Uncle Chuck back to his old self one day, but the old hedgehog only wants one thing changed at that moment...his dirty apron from cooking Sonic so many chili dogs. Who Keeps Stealing My Chaos Emeralds? Somebody is stealing Dr. Robotnik's Chaos Emeralds, and he has video surveillance to prove it. However, the culprit is hidden in the shadows in each video. In order to ensure the safety of his remaining emeralds, he orders Coconuts to head to his secret island base to watch them. Coconuts, on the island, hides out behind a rock near a cave. He catches a glimpse of the thief, but is confident that a number of traps he has set up in the cave will stop them. The first trap consists of two rocks that will smash the intruder after the ropes holding them are burned through. He enters the cave, and notices the intruder walk past the X on the ground between the two rocks. Confused, he stands on the X, wondering how the ropes didn't burn by the time the intruder reached the area. The ropes finally burn through, causing the rocks to smash into Coconuts. Despite the little failure, he has another trap set up: a break-away bridge. The intruder crosses the bridge with ease, confusing him even more. He hops on the bridge to see if it actually works...and it does, sending him plummeting into the canyon below. The intruder has reached the final area of the cave, the location of the remaining Chaos Emeralds. Coconuts has put one more trap, a weight-activated trap that will cause an explosion the second the emeralds are taken off the platform. He watches as the intruder removes the Chaos Emeralds with no repercussions, taking off. Coconuts walks over and checks his failed trap, activating it himself and destroying the cave. Back at Robotnik's lair, angry that Coconuts didn't stop the thief OR find their identity, he sends the bot through his robo-wrecker. Afterwards, he holds Coconut's head, while the disembodied bot complains about the person he hired to set the traps. Meanwhile, in Knothole, a dressed up Bunnie Rabbot reveals the new emeralds she has acquired for her dress for the Knothole charity dance. Robotnik, using his many monitors, looks at the various characters and plot elements that will appear in Knuckles' Chaotix. He witnesses the livelinesses of Vector, Mighty the Armadillo, Charmy Bee, Espio the Chameleon, Heavy and Bomb, Knuckles the Echidna, and Renfield the Rodent. The latter of which has created a theme park, which Robotnik thinks will provide no end to the amusement. This issue brings about the return of Uncle Chuck to the Freedom Fighters. The livelinesses of Mighty the Armadillo, Charmy Bee, Espio the Chameleon and Heavy and Bomb are shown. The transdimensional transporter, the device used to imprison Maximillian Acorn in the Void, makes its debut. Patrick Spaziante's artistic style for Bunnie Rabbot is different than any other artist interpretations of the character thus far, making her taller and more human-like in body style. This kind of style would become Bunnie Rabbot's standard style later in the comic.